Woohoo! 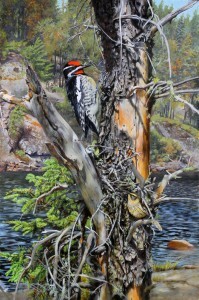 I just got a ‘congratulations’ e mail that my painting, A Warm Afternoon in May was accepted to exhibit in the Leigh Yawkey Woodson Museum, Birds in Art exhibition, along with 95 other paintings from the top bird artists around the world. It is so difficult to get into this prestigious art show, there were 974 entries submitted by 605 artists. I’m thrilled. 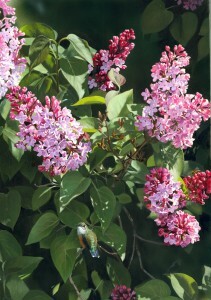 This is my latest lilac painting. It’s a female calliope hummingbird caught in the act of preening between visits to the feeder. I wanted this bird to be almost hidden, with the eye being drawn to the larger and lighter flowers first. That’s the way wildlife is – mostly hidden so you have to search to be rewarded with a glimpse. 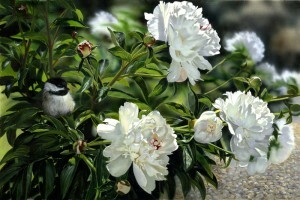 This week I sent my final edition of Peonies & Chickadee to Avenida Galleries AB 403-286-9557. This has been an incredibly popular print. There is still inventory available in, Picture Perfect, Kelowna BC 250-763-6966, Lloyd Gallery, Penticton BC 250-492-4484 and Robert Paul Galleries, Stowe VT 1-802-253-7282. This is the last chance to get one…there will be no more published. I was walking my dog, Eugene, when I saw in the lake a pair of loons with what I took to be their chick. They were calling to it and following it. I watched but there was something strange about the way the chick moved. It was making jerky movements and it was triangular. I doubled back down the path to the edge of the lake and by the time I got there the chick had swum in almost to shore and that’s when I noticed it wasn’t a chick, it was an adult bank swallow. I waded into the water and fished it out. Having swum about 100 yds in a lake with water temp of 11°c, it was cold wet and exhausted. I held it in my hand and could feel it had the will to survive. Back home, I placed it in a box with a soft cloth and a heating pad. What it needed was warmth and chance to rest. Two hrs later the bird was showing signs of revival. I took it back to the place where I found it. By now it was pretty lively. I lifted it out of the box and released it. Watching it fly off, I saw the other birds fly to join it and then it paired off with one bird, I like to think that was it’s mate; a happy ending. I wonder if the loons were looking out for it? They seemed to be trying to help. And at the tenacity, courage and strength of such a tiny bird, out of it’s element in a cold lake and managing to swim all that way back to shore. Amazing. It made my day. 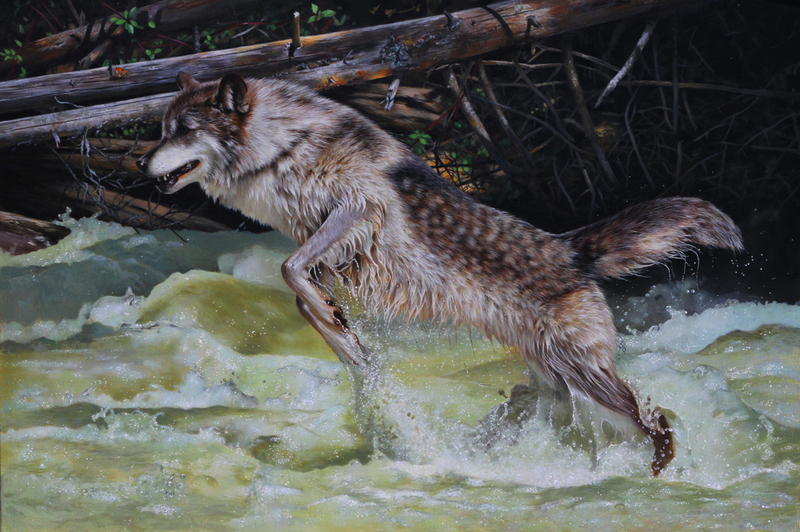 This is my latest painting of a wolf leaping across a flooded river and I plan on making prints from it. The original is staying in my collection for a while. 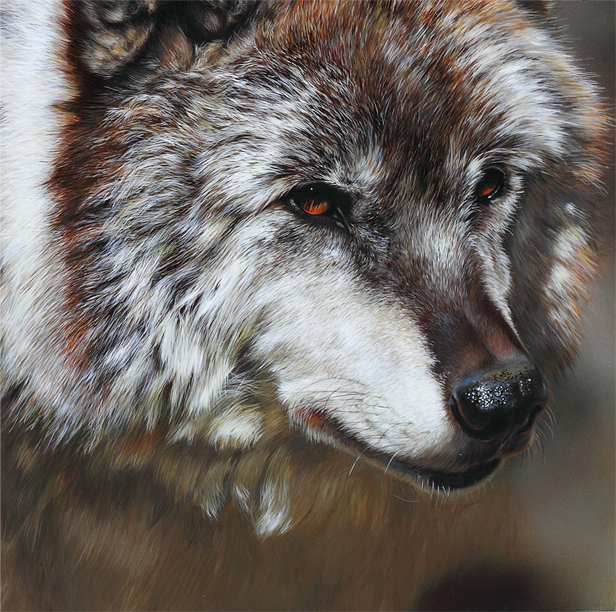 I painted this to help create awareness about wolf conservation. Wolves are not protected in BC. 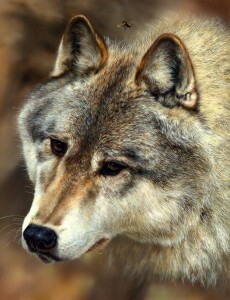 For more information visit the Northern Lights Wolf Sanctuary. 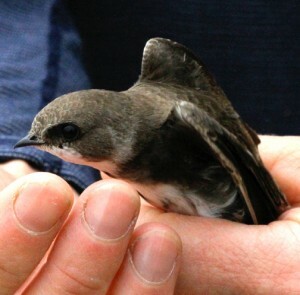 Here is a direct link to the conservation issues and what you can do to help. This is the first painting I did for submission to the Exhibition. In August this year I was invited to join a select group of artists on a wilderness canoe trip to Woodland Provincial Park in Ontario. The goal of this 14th in an ongoing series of wilderness art and natural history expeditions, was to paint and photograph the pristine wilderness that forms the heart of the Boreal Forest. The importance of the Boreal Forest cannot be understated. This is the largest, intact forest remaining in the world. It is an ecosystem of lakes and trees and moderates our climate. It’s a source of oxygen; it purifies our water, and is home to many First Nations communities and to thousands of species of birds, animals, plants and insects. In June I painted Lupa – She Wolf. I did this painting purposely to make an open ended print for Northern Lights Wolf Sanctuary in Golden, something small they could sell in their gift shop to raise funds for their wolf conservation. It’s the only one of my prints that is a not a limited edition. Since then I have such a great response to the painting that I decided to make canvas gicleés from it too.